One of each select Weather-Pack & Metri-Pack Connectors. 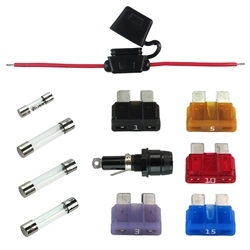 This kit is composed of select barrel and blade fuses; along with two styles of fuse holders. This kit is composed of select Deustch style connectors and pins (DT Series). This kit is composed of select Deustch style connectors and pins (DTM Series). This kit is composed of select 3-Pin AMP style connectors and pins for AGCOs. This kit is composed of select 3-Pin AMP style connectors and pins for John Deere or Case IH Tractors. This kit is composed of select AMP connectors and pins along with some Conxall connectors. 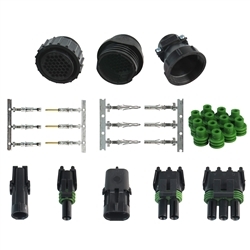 This kit is composed of select connectors and pins commonly used with planter harnesses and adapters. This includes 37-Pin AMP and Weather-Pack connector styles(1-3-Pin). This kit is composed of select 3-Pin AMP style connectors and pins. This kit is composed of select Deutsch and AMP style connectors and pins, as well as 10 AMP Spade fuses.